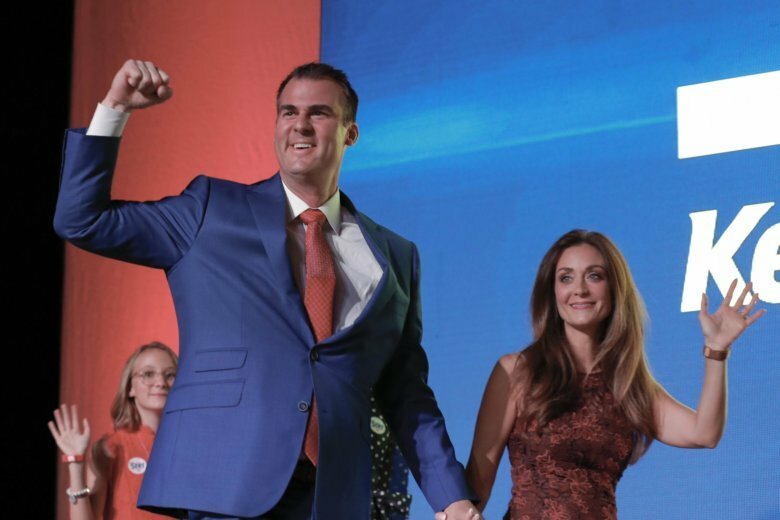 OKLAHOMA CITY (AP) — Oklahoma’s CEO-turned-governor Kevin Stitt rocketed from virtually unknown in politics a year ago to the state’s highest office, largely on his reputation as an outsider with no experience in elected office or state government. Aided by millions of his own money, the Tulsa mortgage company owner defeated formidable GOP primary opponents , including a popular Oklahoma City mayor and a two-term lieutenant governor, before coasting to a 12-point lead over his Democratic opponent in this month’s midterm elections. But Stitt now must pivot from campaigning to governing, a delicate balancing act that requires working with an ideologically diverse Legislature. That has proven difficult for some other business leaders in other states, such as Illinois, who shifted into politics. Unlike the CEO of a company that can hire and fire top executives at will, Stitt faces the reality of being the leader in a weak-governor state, where it can take years to put his own appointees on various agency governing boards. Leaders in the Republican-led Legislature exuded enthusiasm about working with Stitt when he attended a November swearing-in ceremony for newly elected lawmakers. Stitt seemed to share the excitement. Stitt has started assembling a transition team that includes a mix of business and civic leaders with longtime GOP insiders, but has yet to release detailed policy initiatives. How much success he’ll have pushing his agenda once it’s developed is even less clear. He’s already asked the Legislature to give him more authority to hire and fire agency heads, but that could be a heavy political lift that involves amending the state constitution. Gaines had a birds-eye view of the recent governorship of Republican Bruce Rauner, a multimillionaire businessman whose frequent clashes with the Democratic Legislature there led to the state going two years without a budget. Rauner lost his re-election bid earlier this month by nearly 15 percentage points, the largest defeat of an incumbent Illinois governor since at least 1900. Other CEO governors have had more success. Florida Gov. Rick Scott, who was CEO of the largest private health care company in the U.S., served two terms as governor before winning election this month to the Senate. In Michigan, two-term Republican Gov. Rick Snyder, a venture capitalist and CEO, managed to push through an overhaul of the state’s business tax and a right-to-work law, both part of Snyder’s plan to attract more business and jobs to the state. Other notable examples of CEO governors include former Massachusetts Republican Mitt Romney and New Jersey Democrat Jon Corzine, who also was a senator. A study by researchers at the University of Munich that analyzed economic indicators under governors with a business background found that these so-called CEO governors generally take office during times of fiscal strain and tend to have a positive impact on a state’s economy. Stitt, who campaigned with a promise of an “Oklahoma turnaround,” likely will find himself aided by a rebounding state economy, low unemployment and a boom in the state’s oil patch. He also takes over following a grueling year of budget fights between the GOP Legislature and outgoing Gov. Mary Fallin that, while contentious, ended with an agreement for nearly $500 million in new taxes to fund teacher pay raises. For their part, legislative leaders, even Democrats, say they’re excited about having a “fresh slate” with Stitt after eight years of Fallin.